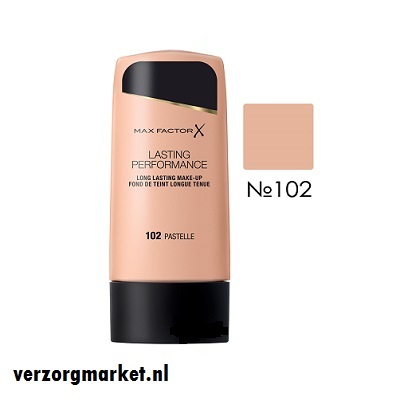 For 8 hours, the perfect foundation, which will achieve you with Max Factor's Lasting Performance. The foundation lubricates well, and the use of silicone feels the Lasting Performance ultralight. And the most beautiful thing is: the touch proof system ensures that the foundation is touch proof, it does not give off and can not fade. Because the foundation does not seal your pores, your skin may keep breathing. Suitable for all skin types, also for sensitive skin. How do you perfect your foundation? Héél important: the base! Always make sure your face is cleaned every morning (both in the morning and in the evening). Take care of your skin with a day and night cream for the correct moisture balance in your skin. If you want your foundation to remain as long as possible, then choose to first apply a primer. To make your face as even as possible, work the unevennesses in your face first and fall under the eyes. For example, Max Factor has the Master Touch concealer (liquid) or the Pan Stick (fixed). Before starting the foundation, shake the product first. For a nice, natural result, create the foundation with a special foundation brush. First put some foundation on your hand, then apply it with your brush on your face. Always work from the center of your face and then make horizontal movements until you have covered all the desired areas. After applying the foundation, apply a powder. For example, you can choose the Max Factor Creme Puff. This ensures that your foundation stays and really stays better. For the finishing touch, bring a beautiful blush on your cheeks, such as Max Factor's Flawless Perfection.